A derelict border crossing steeped in history cuts across the rolling mountain ranges from India to Myanmar. It is at the junction of three distinct geographical regions: the Eastern Himalayas; the verdant floodplains fed by the Brahmaputra river; and the Patkai hills. This route meanders towards the Chindwin river, the largest tributary of the Irrawaddy, which defines the plains of Myanmar. 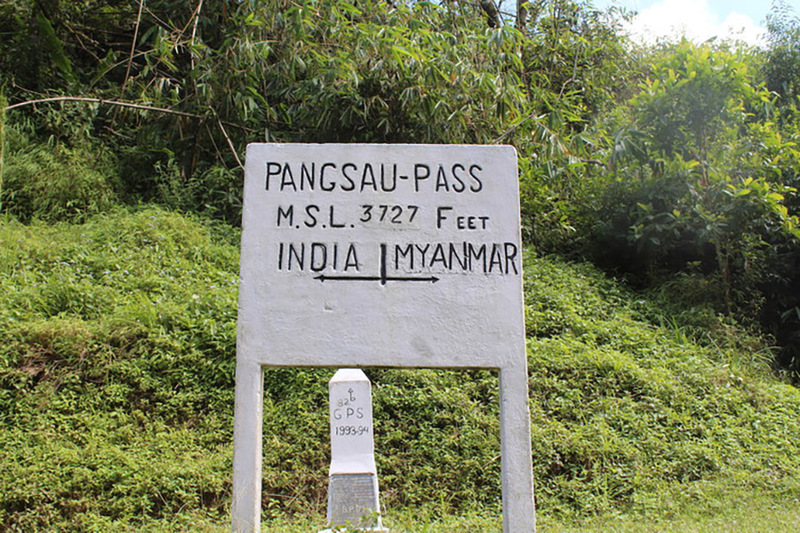 The Pangsau Pass stands at this border crossing between India and Myanmar, bearing witness to waves of migrations over the centuries. Across the Pangsau Pass, in the Sagaing region of present-day Myanmar, lies Pangsau village. The residents there are a mix of ethnic Bamars, mainly considered Burmese (the dominant ethnic group in Myanmar), ethnic Tangsa Nagas who also inhabit parts of the Indian state of Arunachal Pradesh, and some other Eastern Naga tribes. The nearest proper town inside Myanmar from the village is about 60 kilometers away. It is connected by a dirt road, the old Stilwell Road, which is now almost inaccessible during the rainy season. At Pangsau Pass, every Friday is designated as “Burma Day,” when the villagers can cross to India. They visit the market in Nampong to buy essential items for the week. Some people cross on foot, others on rickety motorbikes. Indian citizens are allowed to visit Pangsau village on the 10th, 20th and 30th day of every month, on what are known as “India Days”. Most Indian visitors are tourists, and there is a market held in Pangsau village on these days. The Arunachal Pradesh state government and the local market coordination committee decide on these access days in consultation with the Indian Army, which patrols the border. Pangsau market sells a host of local Burmese products and vegetables, and there are local eateries with Burmese delicacies. These are mostly local leafy vegetables with sticky rice and rice noodle soups. Burmese sticky rice is very popular among the border communities in India. Many Indian tourists also visit the Lake of No Return, where several Allied Forces warplanes crashed during World War II. 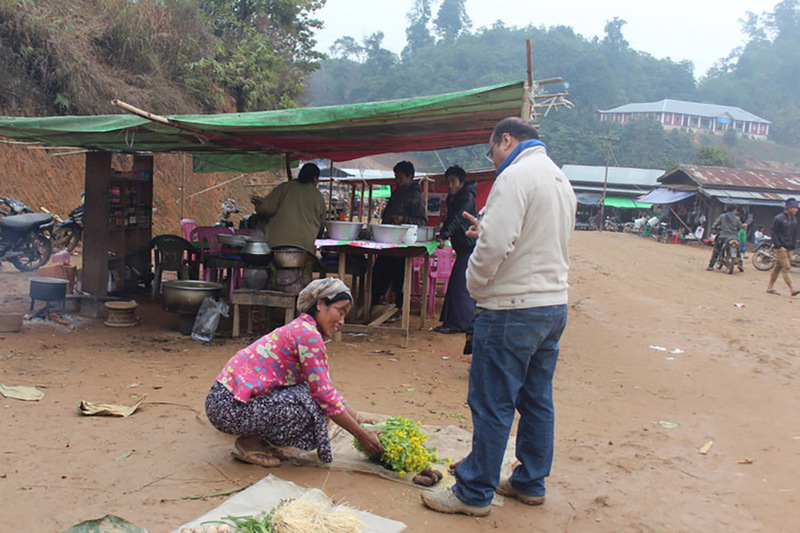 Men roam in longyi, trying to sell their products. Women and children wear bright patches of thanaka on their faces, a yellowish-white cosmetic paste, made from ground bark. The Stilwell Road was constructed under the leadership of General Joseph Stilwell of the US Army between 1942-45. It began in Ledo, Assam, and ended in Kunming, in the southwestern province of Yunnan in China, spanning 1,736 kilometres. This provided an alternative route for Chinese soldiers fighting the invading Japanese during the concluding stages of the war. 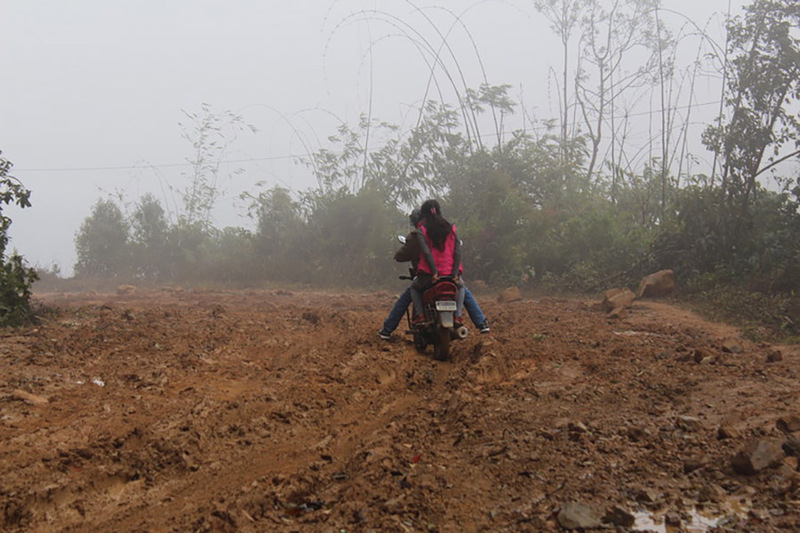 The section of the road that links India and Myanmar has been disused ever since the war ended, and is described by the Chinese as “barely useable”. But the origins of the route go back long before Joseph Stilwell. This was the way Chaolung Sukapha, the first Ahom king, entered the plains of Assam in 1228 AD. He established the Ahom kingdom (1228-1826), which began a period of stability and prosperity in present-day Assam. Several waves of migration happened after that, and they included the six major Tai groups of Assam. The Singphos have also used the route for centuries. The many ethnic groups of the region have this route etched in their collective imaginations. The Tai-Phakey community, which numbers about 2,000 people in Assam, migrated from Hukawng Valley in Myanmar through the Pangsau Pass. They have managed to preserve the old form of Tai language, and medieval scriptures in their Buddhist monastery. According to several members of the community that I met during fieldwork, they have been able to preserve their cultural and linguistic heritage because the closed borders make them feel isolated from their culture. So they preserve all they have left. 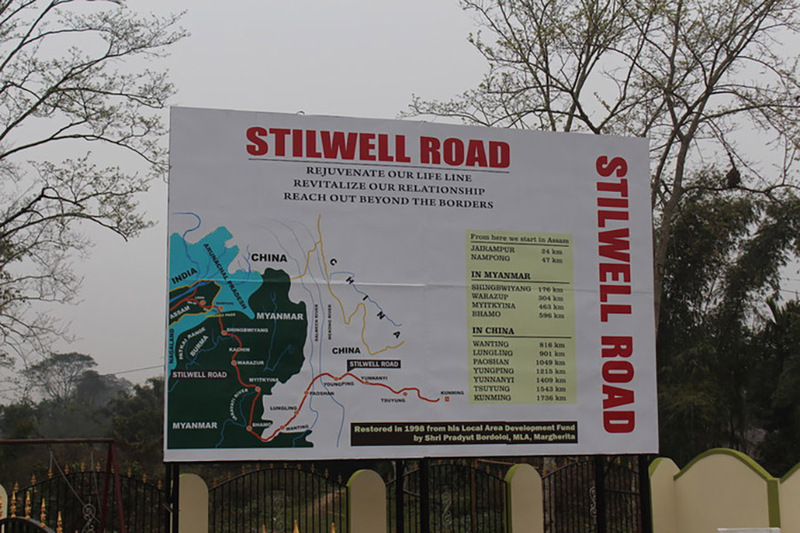 As you approach Ledo, a huge billboard announces the beginning of the Stilwell Road to Kunming, installed by a former Assam minister. This is indicative of the shared aspirations of the people of this region to open up to Myanmar and southwest China. The Pangsau Pass Winter Festival, held intermittently over the past few years, has also demonstrated strong cultural links across the region. The main rationale for re-opening the road is connecting people across these shared borders, along with the exchange of ideas and goods. But there is less interest shown by the Indian government. 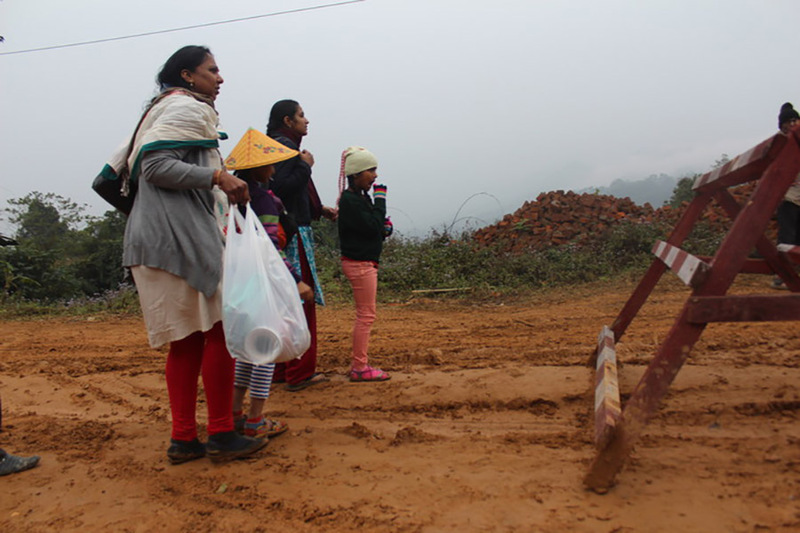 The presence of several insurgent groups in northeast India deters New Delhi from restoring the road. Some Indian insurgent groups are based across this border in Myanmar, with active cross-border operations. The Kachin insurgency against the Myanmar government is also based there. China has shown interest in opening up the route, but India’s hesitation is also based on the fact that some part of it involves the contested territory of Arunachal Pradesh. Boundary talks between India and China about the status of Arunachal Pradesh have been going on for years now, with 19 rounds of talks completed in 2016. It may be complicated, but it is imperative for both New Delhi and Yangon to work towards opening up the road, given China’s continued strategic engagement in the Kachin region of Myanmar. A joint development of these borderlands, which have historically been hubs of migration and exchange, will augur well for the region as a whole. Mirza Zulfiqur Rahman is researcher in International Relations and Politics, Development Studies and Borders, Indian Institute of Technology Guwahati. This article was originally published on The Conversation.